In 1969, one year after Thomas Merton's tragic (and suspicious) death, John Howard Griffin was invited to write a biography of America's most famous monk, a monk who strangely had become a best-selling theologian. The result was Follow the Ecstasy: The Hermitage Years of Thomas Merton (1983). Both Merton and Griffin were converts to Catholicism, and they had become fast friends during Griffin’s occasional retreats to the Trappist Abbey of Gethsemani where Merton was cloistered. As Robert Bonazzi writes in his Foreword, "With natural humility and intense spirituality, they taught each other by example and silence." Merton and Griffin were both photographers as well as writers. Griffin wrote about Merton's painting and photography in A Hidden Wholeness: The Visual World of Thomas Merton (1970). They also shared a fascination with the French theologian Jacques Maritain, as well as French modernists Pierre Reverdy, George Braque, and Albert Camus. Griffin fell ill before he could finish his biography of Merton, and the mantle of official biographer passed to Michael Mott, author of The Seven Mountains of Thomas Merton, an essential compendium of the monk's life. 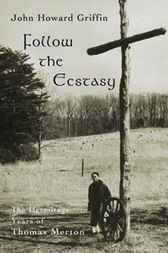 Yet Follow the Ecstasy gets closer to the mana portrait made by one who shared not only personal histories and interests with Merton, but an "intuitive perspective of solitude."